I’m a bit late, I know, to the party on the Lee Keegan story that’s been all over the media in the last 36 hours or so. Truth be told, it’s because I’m so gobsmacked about the facts in the story that Lee felt compelled to reveal to Mike Finnerty in this week’s Mayo News and which Mike then recounted so well yesterday evening on Newstalk’s Off The Ball show. At one level, there’s a real Mayo GAA story here. One of our most important players, one of the finest performers ever to wear the county jersey, has had to undergo keyhole surgery on both of his hips at the age of 28. The surgery will sideline him for months, which will mean he’ll miss the bulk of next year’s League campaign. I’ve no problem with our having to battle through the 2018 spring campaign without Lee’s on-field presence. It’d be better, of course, if his absence wasn’t an enforced one but this is a player who hasn’t really had a break of any kind since the closed season after the 2015 championship campaign – going from the 2016 season straight into the International Rules, then to the All-Ireland run with Westport and back to inter-county action as soon as that was over – so he’s undoubtedly due one now. Lee invariably plays at his peak when the stakes are highest for us. A longish break between now and next summer will, hopefully, mean that he’ll be back to full fitness by the time the serious action is starting next year. Ready, once again, to shepherd key opponents off to that mysterious place known as Keegan Island. Lee’s surgery and its implications should have been the story about him this week. But, of course, it wasn’t. Instead it was the sad and rather scandalous rumour-mongering about him that has swirled around the county over the past few weeks. Spreading baseless rumours about individuals didn’t start with the advent of social media. In the age we now live in, however, they’re easier to start and to spread than ever before and, once they take off, they’re impossible to rein in. They’re like a virus. They go viral. The world is, of course, full of false stories and it’s harder than ever to separate truth from downright lies. But everyone has a choice here, which is deciding whether or not they want to be part of the fake news problem or part of the solution. In this regard, those who helped this baseless rumour about Lee gain traction need to have a good, hard look at themselves. There was a whiff of the rumour here on the site too but, thankfully, people have the sense to know that that kind of crap won’t be tolerated in these parts. Hopefully by Lee going public with details of the distress this false rumour has caused to those close to him it will give everyone pause to think about the consequences of helping to spread stories of this kind. If so, he’ll have performed a valuable service, albeit in relation to an issue he should never have been made to feel obliged to go public about in the first place. Get well soon, Lee. Here’s to more great things from you on the field of play in 2018. I think as u said WJ its a refectlion of society unfortunately. People learn from it privately and leave it be. Speedy recovery Leeroy can’t wait to c u back in action and the noise from da stands when u enter the fray will show u how much u mean to us all. Also thoughts and prayers to all people who unfortunately suffer MS.
Keegan island, I love it. I heard this from a relative a few weeks ago and lost it slightly that this bile was being spread around with no thought for his family. I later apologised (kind of) but the sentiment remained. I feel really disappointed that Lee felt he had to even acknowledge this shite but hopefully it might prevent a recurrence in the future. This can’t be blamed on social media either as this kind of BS has been peddled in Mayo and beyond for years. I’m not sure Lee was ever moving at top gear last year. He was still decisive in many games for us but he relied on quality rather than quantity in his breaks forward. If one our ‘creatives’ doesn’t come up with a Keegan Island T-shirt in time for May I’ll be sorely disappointed! I’m with you on the Rock! Keegan Island t-shirts for all! only a few short weeks till we go again, i cant wait for our 2018 journey to begin again . They used to say back in the 70s that the 2/3 yard patch around Paudi O’Shea was a lonely place in Croke Park for a forward, the same can be most certainly said about this man, 2 great players. Well stated John, thank you for eloquently expressing the true heartfelt feelings of all us loyal Mayo fans that are honored to support such great players and management. As it is Thanksgiving Day here in the States, we remain grateful for our dear Mayo friends and family and we wish Mr. Keegan all the best in his recovery and some well deserved rest and privacy! Happy Thanksgiving all!! I would like to know who those people are. ( Ref yew tree) They surely don’t have family member with M.S , shame on you and whoever started rumour about Lee. Not a good sign when a player that just made his senior debut 7 years ago and is just 28 requires surgery on both of his hips. The rumours was disgrace but when you have online social media sites such as banter facebook pages should we be surprised with such rumours? I’ve heard of that Keegan Island out someplace in Clew Bay alright. Im told that as soon as you set foot on it you are enveloped in a fog and become completely disorientated not knowing where you are or what your meant to be doing, even the most simplest tasks become next near impossible. After just 75 minutes on the island people are said to be found wandering around the middle begging to be taken off and raving nonsense about how they thought they were the best. Twas an Inishturk man that told me the storey and I have no reason to doubt him, he said they have rescued people at any time over the past few years but the effects seem to be more noticeable in August and Septemebr. Rumours were and are terrible – the way they assume certainty is what is so dangerous about them. That said, it’ll be quite a while before he’s operating at the top of his game, which is worrying. And will Andy’s hamstring have cleared up for the start of the league? Then there’s Aido who really needs a rest with his groin. Hope Rochy is burning the midnight oil. Nasty, vicious people populate the so-called social media zone. I’d go so far as to say some of them are evil, black as chimneys inside. Yes, they have been around a long time, this sort. One only has to read some vintage Irish novels. But they’ve been given rein by the internet. Andy and Lee will be fine for summer, that’s the key. 4 months out for Lee but I’d be fairly confident he will come back sooner. Thoughts on Corofin match Mayomark? Think on two weeks rest ye will have the pace and power. Anyone know if TG4 are showing the Corofin v Mitchell’s game? Yes its live on TG4. Have a feeling Castlebar will win it also. Get well soon Lee Keegan. And please let the rest of our players take a good break. It doesn’t take much for a rumor to grow legs and spread very fast. @MayoMark .. Best to luck to Castlebar at the weekend …. Hope all goes well for ye .Seems to be a quite build up for such a big game !! I’d imagine Mitchels are quietly confident going into this game. Corofin missing Micheal Lundy due to an appendix op is a big loss for them. He created their first goal against Brigid’s and was involved in a lot of their play. Although Daithi Burke will probably start instead and he’s obviously a fine player too. Castlebar’s strong runners like the Durcans, Cian Costello etc will be important to draw frees. Corofin were very ill disciplined the last day out. Stenson and Douglas should punish them if they do similar on Sunday. Also Mitchels would seem to match up pretty well to the Corofin danger men. Ger McDonagh on Martin Farragher, Newcombe on Ian Burke & Paddy on Gary Sice. Lee’s our best player ever, and hopefully the rest will re-charge him. He has set the standard for half back play. When one reflects on his performances in Croker this summer how did he not get his 5th all star? The complete Gaelic footballer. Puckout..my thoughts exactly.word for word! 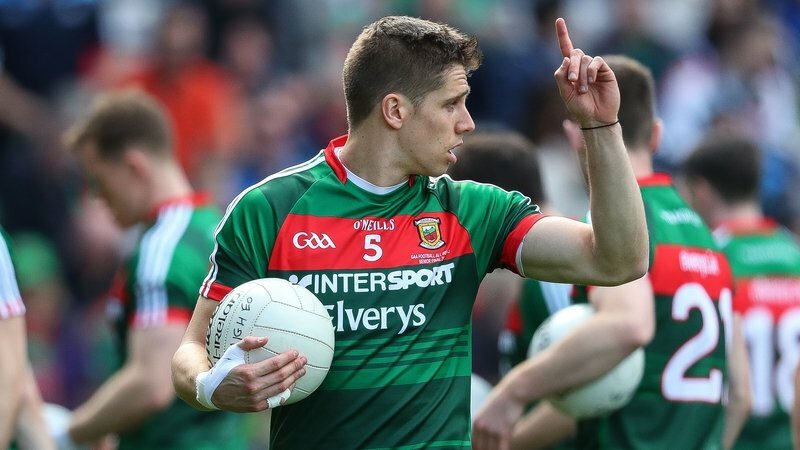 We are blessed to have Lee as a mayo footballer. Hope recovery goes well Lee. Good luck to Castlebar. Wishing Lee all the best in surgery, a nice rest and a speedy recovery! Wishing the best of luck to Lee on his recovery from surgery and also best of luck to Castlebar Mitchels in the Connacht Final! Douglas and James Durcan look abit lightweight when on top defenders today.Sum of Danny Kirbys decison making with shooting today wasn’t good enough.Castlebar are gone past there best compared to when they had Richie Feeney , Tom Cuniffe and Tom King in the team and really should have took there chance of an All Ireland against Ballyboden in 2016 but didnt turn up on the day, next years county championship will be interesting in that we could see a new emerging team in maybe Tubber, Breaffy,Claremorris,Knockmore Garrymore or Westport .It now leaves a full hand for Stephen Rochford to pick his Fbd and Nfl panels for 2018 and maybe try some potential players with Lee Keegan and maybe a few more senior players getting a well earned rest. Think you’re being a bit harsh on Castlebar. They’ve a young panel now and won the county this year despite losing a lot of experienced lads. I’d have them strong favourites to win the county title again in 2018. Also don’t know how you can be critical of Douglas after today. He won almost every ball played into him including some over his head. Probably the best forward on the pitch. Best forward on the pitch was Ian Burke in my opinion probably the best forward in Galway I would rate him better than Damien Comer and Shane Walsh.Wasnt critical of Douglas just thinks hes a bit light and I just dont see him as good as the 6 forwards for Mayo thats there at minute but maybe an option from tge bench but he deserves a good run of games in the National league which he hasnt got from Rochy then we can judge if hes good enough.